Facebook: Should parents 'friend' their children? When Facebook was entirely dominated by people under the age of 25, things were simple. But now an important social question has arisen - should you "friend" your child, or accept a parent as a "friend"? For a generation brought up on social networks, your "friends" can range from closest confidants to someone you met at a conference. People you've "friended" for networking purposes are afforded equal status to your sister. Your friends on social networks might also be your 20-something son who's travelling round Thailand or your 13-year-old daughter. These are tricky waters for a parent to navigate, unsure of security settings and wary of others on the internet. If you are on Facebook, should you be friends with your kids? "It's hilarious to say, isn't it? That my child is or is not my 'friend'," says Susan Maushart, author of The Winter of Our Disconnect, about her family's six-month detox from technology. As well as spending vast amounts of time on Facebook, her children weren't making eye contact or talking to each other in person. Maushart attempted to claw back some parental presence and influence by "friending" her three children. Two rejected her outright. One daughter accepted her request, but only after introducing strict boundaries, prohibiting her mother from commenting on photos or criticising. This helped prompt Maushart's experiment in disconnecting her household for six months. Six months away from technology radically changed family relationships, and now Maushart has forthright opinions about the role of the internet in the family. The danger is that through a lack of involvement or understanding in their children's social networking, parents begin to feel, as Maushart did, "powerless, irrelevant and rejected". So should a parent "friend" their offspring on social media to keep an eye on them? "If that was your intention as a parent, to use Facebook as a form of surveillance, I think that's wrong," says Maushart. "That's an invasion of your child's privacy and they should reject your 'friend request'." Lindsay Stewart, 15, completely understands why you'd refuse a parent's friend request. Her household have agreed on not becoming Facebook friends. "Mum said that she was going to get on Facebook," Lindsay says. "She said she wasn't going to ask to be friends. Me and my brother were relieved." Lindsay's profile settings are quite private, and while there may be nothing obviously embarrassing or secret being discussed, it's not a place she wants her mother to have access to. "It's a community," she explains. "Our parents aren't there in our groups in school." Lindsay then mines the streak that leaves the likes of Maushart feeling so disempowered. 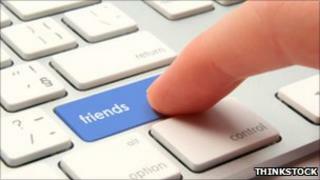 "I primarily joined Facebook to have conversations with my friends. My mum is my mum. I like her, but she's not necessarily what I'd call my friend." "Mum" is Sandy Stewart, a 50-year-old Indiana-born mother of two now living in South London. Mrs Stewart has strong, pre-defined opinions about what role a parent should play on the world's biggest networking site - stay well away from your children. "I wouldn't dream of being friends, there's no way," Mrs Stewart insists, and suggests attempts at "friending" could seem like an invasion of privacy. Facebook, as her kids use it, is their world. What they comment, chat or post on there is tantamount to what they choose to include in a text message or say to each other at school. "No parent has had this access to their kids' thoughts and movements and conversations before," says Mrs Stewart. "Just because it's now technological, I don't think it means that we should." Lindsay says there is a similar level of privacy inherent in texts and Facebook. "If my parents were to read my texts, I think anyone would be angry. It's the same thing, having a conversation or uploading pictures on Facebook." Yet Tim Harness, 54, and his daughter Josie, 18, are "friends" on Facebook and perfectly happy. Josie left home in the summer for university in Plymouth, and Mr Harness can see her student existence unfold online. "She puts on loads of photographs… I have a little look now and again," he explains to me. "It's quite fun to see who her flatmates are. She seems to be having a good time." Josie tells me it's reassuring to know that her father's checking up on her occasionally. She has plenty of family friends and what they see on her profile doesn't concern her. "The worst [dad might] see is a photo of me a bit drunk," she says. "Is it an invasion of privacy? Not really. Everyone has Facebook these days. The only reason you wouldn't want them is if you've got something to hide, if you don't want them to see what you're doing."